Everyone has trouble with their computer eventually, so why not be ready in case of disaster? We at SofTech Computers would like to explain the benefits of regular backups and how they can help protect you from cyber-crime, ransomware, hardware failure, and theft. By simply backing up your data once a month, you can save yourself a lot of frustration, headache, time, and money. Scammers lurk around every corner on the internet, and will often try to extort money from you if you are caught in one of their traps. Many of these scams involve ransomware, or a computer virus that locks down your computer, and the only way to free it is to send the criminal money, sometimes upwards of $1,000. By keeping a regular backup of your computer, you can say “go ahead and keep it!” because all of your files will be conveniently ready for recovery. With just a click of a button you can be back up and ready to get back to what you were doing. And even if it isn't that easy for some reason, it makes the turnaround time at any computer shop much lower. Another good reason to backup your data is to protect yourself from hardware failure. Just like anything else, computers break over time. They slow down, and come to a crawl, and then eventually crash for good. And, from our 21 years of experience, we can tell you that the most common part to fail on a computer is the storage device, also know as the hard drive. These fail generally after 4-6 years of use, but can be sped up significantly by drops, vibrations, and prolonged use. By backing up your data onto an external device, you can save you pictures, documents, and other important data from a hardware failure that would otherwise corrupt your information. Imagine if someone were to break into your house and steal your computer: do you have a copy of your data to replace what was lost? Or perhaps you have a laptop that was stolen on vacation: where is your information? In these two situations, a backup to an external device would have saved all of your information. Most criminals probably wouldn’t look for an external drive with the computer, and, in the case of a laptop, your backup probably wouldn't have been near the laptop in the first place. Windows Backup or Another Backup Program: This particular method of backup is most preferable, but at the highest cost and longest time, may not be the best for everyone. 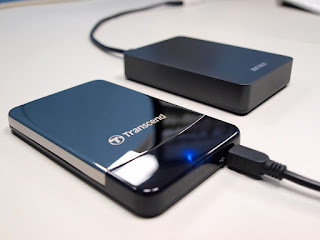 The main benefit of this backup method is the ability to completely restore your computer, rather than just transfer important files, in the case of disaster. Cloud Backup Service: The main benefits of this type of backup service lie in its security, ease, speed, and ability to retrieve your files over the internet. Backing up your information is key to your data’s security and your peace of mind when using a computer. By backing up your data, you can save yourself a lot of money and time if disaster strikes. So what are you waiting for? Call SofTech Computers today at 928-443-8770 for more information on backups.